Reading this story about InWorldz at Hypergrid Business got me to thinking about how OpenSim worlds should not replicate two of Linden Lab's biggest failures. No virtual world will bring in mainstream educators and students without a client as intuitive and simple as Unity (or the Jibe client based on Unity from Reaction Grid). I don't know why more grid owners fail to grasp this. Is it a tyranny of thinking like an engineer? Admit it, coders: you often have the same sort of disdain for users that my Physics colleagues have for we bumbling, windy Humanists. I know this disdain is correct, but could you make it a little more private? At least the Physicists don't depend on us for a living. Coders working for a grid do, if the grid is a money-making enterprise. I'll say it until I keel over: Educators must be able to import AND export content they create. Backup of entire sims would be even better--something one cannot do in SL. InWorldz fails here worse than SL, where I can export my own IP, bit by bit, to do with as I please. In InWorldz, "users cannot export their regions or inventories as OAR and IAR archives — a function offered by most OpenSim hosting providers." I'll know more about InWorldz, which is not truly an OpenSim grid but one following its own path, when I visit to review it for Prim Perfect. But they've already lost my recommendation to other educators. That said, I don't think that is the customer they are chasing, and if so, that's not a problem. What irked me about Linden Lab's recent move is how they courted us for a while, then effectively scorned us. For now, however, InWorldz seems a great choice for social users wanting a friendlier and more responsive provider of virtual-world services. That's a different secret sauce altogether. Not all of us can host our own servers. My idea to do that (for next year, anyhow) got a thumbs down. So we need a grid that permits backups. As for the UI, that's up to developers in OpenSim and walled gardens such as InWorldz, SL, and Blue Mars. Virtual-word providers who can get this secret sauce right: for educational builders data backups and for educational newcomers an easily mastered UI, you'll get a lot of business from us that Linden Lab is now losing. Update: See Lalo's comment. I'm hoping for OAR backups as well as IAR. Thanks to Lalo for the clarification that individual export/import works fine. It's slow and it's how I'm pulling content I made out of SL right now. I do agree about the data back-up, I mean, who the heck wants to loose years of purchased inventory. However, having recently tried the Unity/Jibe UI, I personally feel that is totally the wrong UI to go with. I'll embrace Viewer 2 or 1.23 UI before I'd ever think about getting lost in Unity/Jibe again. Of course we all have our likes and dislikes, so where we agree its fantastic. When we don't have the same opinion, we will just have to stand in our separate corners and just agree to disagree. I'm not crazy about the display size of the Unity UI. That said, something *as* simple (if not that very client) would aid retention. We use the clients we do because we know how to use them and even need the intricacy. Most of my students need nothing more complicated than being able to change appearance and log their chat for projects. Don't confuse your readers by conflating OAR and IAR backup operations with exporting your own IP through your viewer of choice. OAR is a backup of an entire region; IAR is a backup of the personal inventory of the region's owner; neither can be done in SL any more than in InWorldz, for the same reason: who controls the servers. However, Pathfinder tweeted about this new service the other day: Pleiades. They claim to be able to create an OAR from a SL region. How they manage that is beyond my limited geekiness... but if they can pull it off there, there's a reasonable chance they can do it in InWorldz, too. Meanwhile, viewer-based import/export works just as well in InWorldz as it does in SL and OS-based grids. Using Imprudence, I have transferred items I created in both directions. Let me know when I can meet you in IW, and I'll show you some I built in OSGrid, exported to SL, and re-exported from there to IW. There's a very good reason why OpenSim developers aren't plowing a large amount of money into Web-based viewer development (except for the Rezzable project and the Gojiyo project in India). 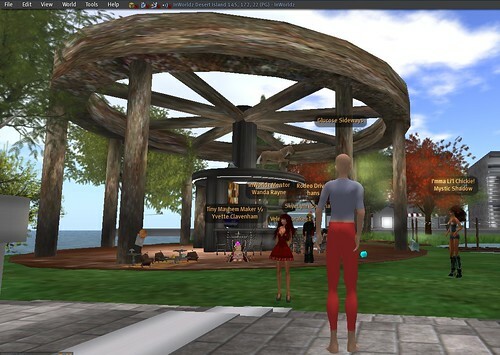 Second Life has already announced that they'll be working on a Web-based viewers. All their other viewers have worked fine for OpenSim, so there's a strong possibility that their Web-based viewer will work for OpenSim, as well. In that case, all the independent development that goes on will have been totally wasted, since the vast majority of folks out there just stick with the SL-approved viewers. The same thing recently happened with mesh. The realXtend team put in a HUGE amount of effort getting mesh into OpenSim, and creating their own viewer, Naali, to display meshes. Now that SL has mesh support built into SL viewer 2, and the OpenSim guys will adapt their meshes to work with it, the whole Naali-realXtend project becomes a dead end. Questions about which technology is better, and which solution is more elegant are pretty much irrelevant here -- the big question is of critical mass of adoption. And, right now, SL is the big elephant in the room. What they do affects what the users do. And that, in turn, affects where investment money is placed. @Lalo--thank you. Readers will be confused because there is a TON of confusion on the SLED list about this. @Maria, you are far more savvy about the development of these worlds than I am, and I think your claim makes good sense. I do believe that a large edu market can emerge if a simpler Web-based UI will let students and colleagues come in to use simulations we build. Who builds that client matters less to me than that someone develop it. Further on Maria's point about the viewers: again, because of "elephant in the room" syndrome, the SL/OS-compatible 3rd-party viewers will undoubtedly be porting mesh capability by way of Snowglobe, as soon as they can. Which means that we who abhor Viewer 2 won't be left out.